The Armed Forces Vocational Aptitude Battery (ASVAB) is the test the military uses to determine whether or not one has the mental aptitude to join the military, and—if so—what job(s) they may qualify for. The ASVAB is taken by more than one million military applicants, high school, and post-secondary students each year. Anyone who enlists in the military must take this test. The overall percentile score, known as the AFQT Score, determines whether or not one can even enlist. In addition to the overall AFQT Score, individual composite scores determine enlisted job qualifications. The ASVAB consists of ten individual tests, but only four of the tests (Word Knowledge, Paragraph Comprehension, Arithmetic Reasoning, and Mathematics Knowledge) are used to compute the overall ASVAB score. If your goal is to improve your overall score, you should choose a study guide which extensively covers the math and reading/vocabulary portions of the test. On the other hand, the other six areas of the ASVAB Test (General Science, Auto and Shop Information, Mechanical Comprehension, Electronics Information, Numerical Operations, and Coding Speed) are used (in addition to the above four areas) to determine job qualification(s). If your goal is to qualify for a specific job, you should choose a study guide which covers the specific areas of the ASVAB used for that particular job qualification. There are three versions of the ASVAB: the computer adaptive test (CAT), which is automated and given at Military Entrance Processing Stations (MEPS); the MET-site version, given at one of several Mobile Examination Sites around the country; and the student ASVAB, given to high school and college students. The CAT version of the test is timed and takes about an hour and a half. This version is the one given most frequently to military recruits. The MET test is a pen-and-paper version and is more suitable for recruits who may need to take more time and go at their own pace. A referral from a recruiter is required for the MET test; when you complete your test your results are sent to the recruiter, who verifies them and helps you assess your scores. The student test is also a pen-and-paper version and is given in conjunction with a school career counselor, who can help interpret the results and what course of study a student may wish to pursue based on how they perform in specific areas of the ASVAB. 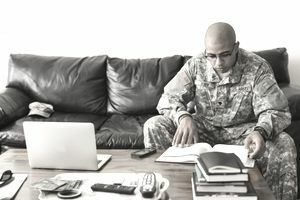 Some ASVAB study guides are simply practice versions of the test, while others go out of their way to explain the various subject areas and give tips and examples on how to arrive at the correct answer. In general, the more pages the study guide has, the better the chances that the guide will provide detailed explanations. There are also practice versions of the test online that simulate the CAT version of the test, where answers become progressively harder or easier depending on the participant's answer to each previous question.